Mergify: Vonyich Manuscript "The book which no one can read"
Vonyich Manuscript "The book which no one can read"
Throughout the history of mankind there have been many questions that have been left unanswered and "VONYICH MANUSCRIPT" is one of them. For almost 100 years experts and researchers have tried to solve the mystery behind the manuscript and its content, but none of them succeeded. The numerous theories to unravel the mystery behind this manuscript are contradictory and rang from plausible to adventurous. 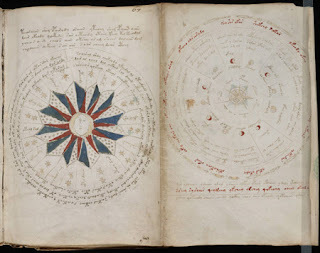 The modern history of the manuscript began in 1912, when an Italian book collector and seller Wilfried voynich" found it in an Italian Jesuit college and carbon dating proves that the manuscript was first written in the 15th century(between 1404-1438).the manuscript is written in a language unknown to man. There are between fifteen and twenty different letters in the manuscript. The language can be brought in line with European languages, because the average word length is four or five letters. However the language of the manuscript does not correspond with any of the European language because the voynich has no two-letter words or words with more than ten characters. The only idea anyone has of its origin are the drawings and illustrations found on various pages. Unlike the text, the illustrations can be divided into different sections and can be distinguished as botanical, astronomical, balneological, cosmological, pharmaceutical and chapter with food recipes, And the problem is none of them match with the species of plants , animals and astronomical units known to man. statistical analysis of the text indicates it was written in a natural language and no flaws were found in the writing which means the person who wrote it had a very good command over the language and isn’t a hoax. The different illustrations can hardly be related to one topic. Thus, one can possibly say that it is a textbook for magicians, physicians, and astrologers but when it comes to these professions their borders were still blurred 500 years ago. It is hardly illuminating to take look at the astronomical and cosmological sections, which contain pictures that can be identified as the zodiac signs still familiar today. Unfortunately, this observation does not result in further insight into the book. The celestial bodies illustrated in the astronomical section cannot be identified and probably are only figments of imagination or they belong to some other star system (but how the hell can they know about other star systems in fifteen century...this raises some questions which conspiracy theorists link to aliens...aliens). There are two theories worth mentioning about the manuscript. The first one is based on a fact that is known by every cryptologist, that the design of a secure text is longer than the original text. Under this condition, it is possible to hide the original information in the meaningless filler text, then there is only a minimal chance that it will ever be decrypted....but this trick only works when you make meaningless sentences out of known languages, so if that is the case then the author of the book must have known the language used in the manuscript. And the second theory is based on what the conspiracy theorists say. They believe that the manuscript is a encyclopaedia of knowledge given to man by the extra-terrestrials who visited them at the time. So, question is why would any take such an effort to write a book in a language unknown to others???????? Did the people or the person who wrote the book didn’t want anyone to know about its contents?? does it contain secrets unknown to mankind like attaining immortality or the medicine to cure any disease or interstellar space travel Or does it describe about the species of another dimension(from another world) or is it a mere hoax as proposed by many theorists. What does the manuscript really contain about?????? These questions still remain unanswered.